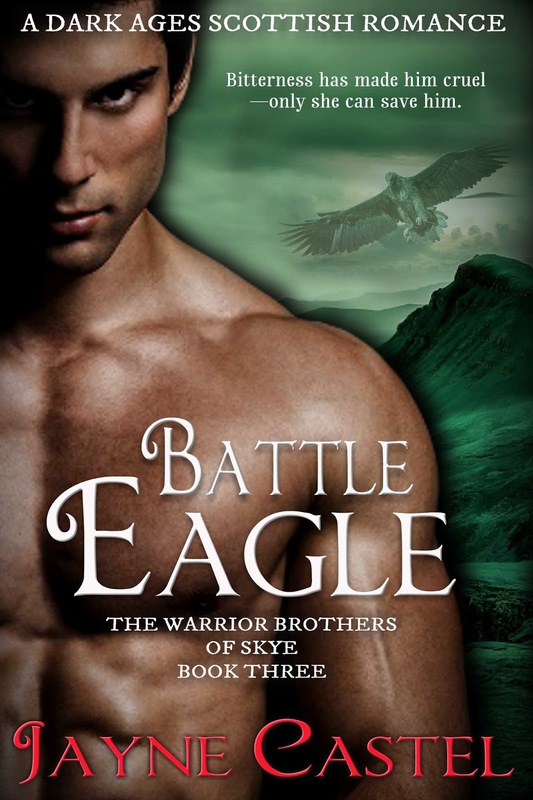 It's now just under two months until BATTLE EAGLE (Book #3 The Warrior Brothers of Skye). The novel is available on pre-order from Amazon, but while you patiently await for it to be delivered to your Kindle on May 31 2018, here is a scene from the novel for you to enjoy! She caught up with him, just as he entered the stone arch that led towards the broch. He ignored her, and so she reached out and grabbed his arm, pulling him up short. "Donnel--wait!" He turned, his dark eyebrows rising in surprise. Not for the first time, Eithni was struck by just how handsome he was. The plaid breeches and leather vest he wore showed off his tall muscular body. His chiseled features, beautifully molded mouth, straight nose and long eyelashes were breathtaking. All three of the brothers--Galan, Tarl, and Donnel--were attractive but, to Eithni, Donnel was the most striking. Only, bitterness had cast a harshness over his features. She had set eyes on Donnel mac Muin for the first time nearly two years earlier, at Tea and Galan's wedding. He had been married then; his lovely wife Luana heavily pregnant. Even so Eithni had been captivated by The Eagle warrior. How she had wished to find a man so handsome for herself. But that was before she had returned home to Dun Ardtreck--before Forcus. "You can't keep doing this," she gasped, out of breath from running after him. "It won't bring her back." His mouth thinned, and his gaze narrowed. "What?" "You have to let your anger go. Talor needs you." His expression turned thunderous. "We've had this conversation before, Eithni. I don't need to hear this again." She put her hands on her hips. "Clearly, you do. Talor has just lost his uncle--a man he sees as a father. Did she imagine it, or did Donnel flinch at that? Headless she pressed on. "Mael is on her own now. She needs your help." She saw a dangerous light ignite in those slate-grey eyes then. All three of the brothers had the same eyes, the color of a stormy sky. Donnel stepped forward, leaned down, and pushed his face close to hers. "I never thought you to be simple-minded,"he growled, "but today I swear you have the brains of a goose. Heed me, woman. I do not wish to see the lad. Stop meddling and leave me alone." He turned then and strode off, crossing toward the steps leading up to the broch. Eithni did not follow him. She dropped her hands from her hips, the fight going out of her. She suddenly felt shaky and close to tears. Confrontations were never easy for her at the best of times, but Donnel's grief had given his temper a vicious edge. He had left her badly shaken. Eithni inhaled sharply and dashed away a tear that rolled down her cheek. Enough. Don't let the man get to you--don't waste tears on him. Release date: May 31, 2018. BATTLE EAGLE is available on pre-order!